Laurits Andersen Ring (1854–1933), Alder Trunks (1893), oil on canvas, 52.9 x 73.5 cm, Collection of Her Majesty the Queen Margrethe II, Copenhagen, Denmark. Wikimedia Commons. When his friend H A Brendekilde headed off for Europe and the Middle East in 1890, Laurits Andersen Ring (1854–1933) was touring Denmark painting a remarkable series of portraits of workers at their workplaces. He kept in touch with another friend’s wife, Johanne Wilde, in a series of intimate letters. Although Ring was deeply in love with her, she had a young family and never allowed the relationship to progress. 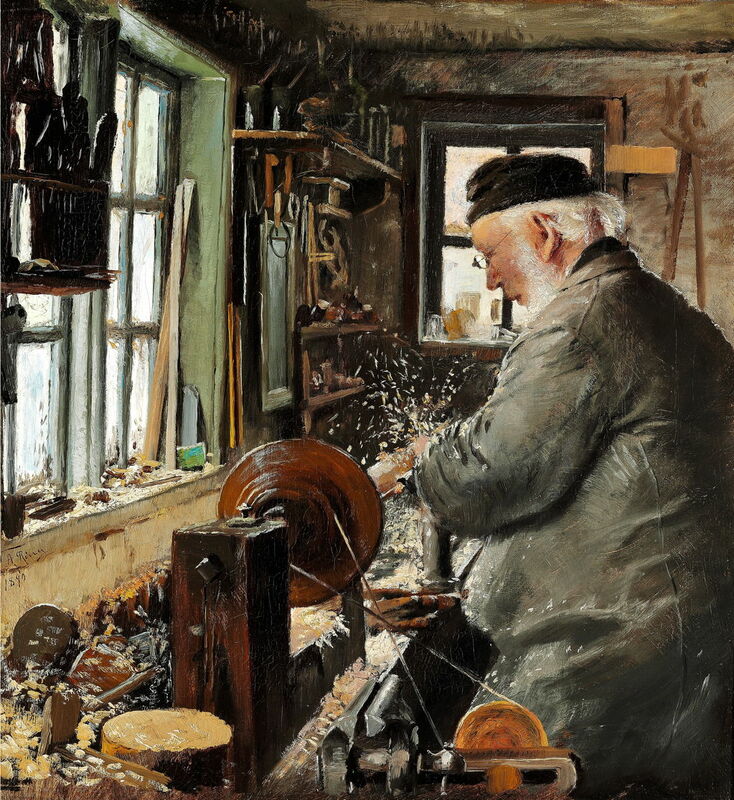 Laurits Andersen Ring (1854–1933), A Turner at his Lathe (1890), oil on canvas, 40 × 36 cm, location not known. Wikimedia Commons. A Turner at his Lathe from 1890 shows an unidentified craftsman turning a piece of wood on his treadle-powered lathe. Flakes of wood are flying in the air as he shapes what might become the leg of a chair. In each of these portraits, Ring is careful to show the humble surroundings in which these skilled workers exercised their craft: here a cramped and small workshop lacking in modern conveniences, and probably cold for much of the year. Laurits Andersen Ring (1854–1933), Herman Kähler in his Workshop (1890), oil on canvas, 48.5 x 59 cm, Randers Kunstmuseum, Randers, Denmark. Image by Villy Fink Isaksen, via Wikimedia Commons. 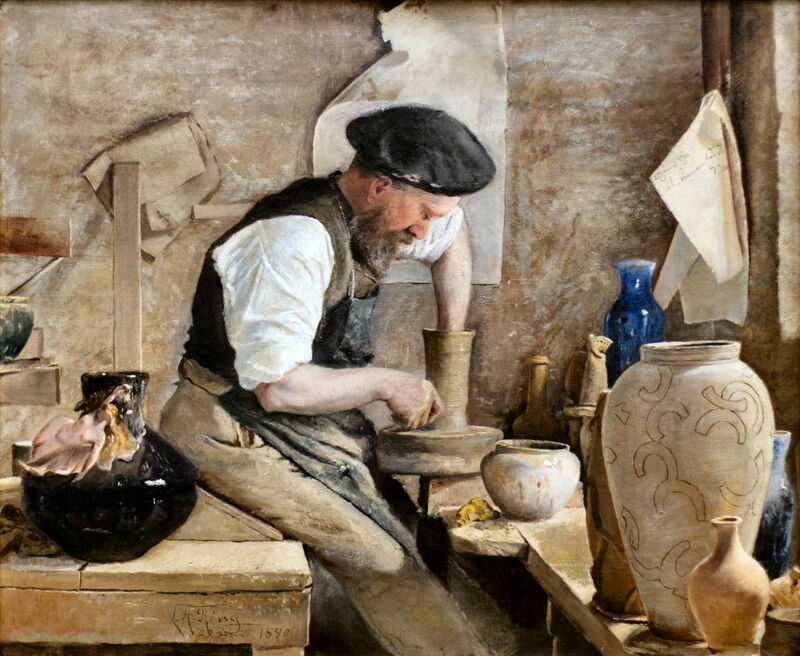 Herman Kähler in his Workshop, also painted in 1890, shows the celebrated Danish ceramic designer and potter Herman A Kähler (1846-1917), who took over the family ceramic factory in Næstved, Sjælland (Zealand), in 1872. He is now commemorated in the name of a rich ruby glaze, Kähler red. He had achieved considerable success at the Great Nordic Exhibition of 1888, and the following year at the Exposition Universelle in Paris. Both Ring and Brendekilde designed work for his factory to produce. Kähler is seen turning a pot by hand on a treadle-powered wheel. Carefully arranged around him are examples of his work in various stages of completion, including three which are finished and glazed. Laurits Andersen Ring (1854–1933), Boy with a Crossbow at the Foot of a Hill (1890), oil on canvas, 40 x 34 cm, location not known. Wikimedia Commons. Ring also painted more rural ‘genre’ works. This Boy with a Crossbow at the Foot of a Hill from 1890 shows an older boy from a peasant family armed with his crossbow, which was presumably used to shoot birds and game with which to supplement the family diet. 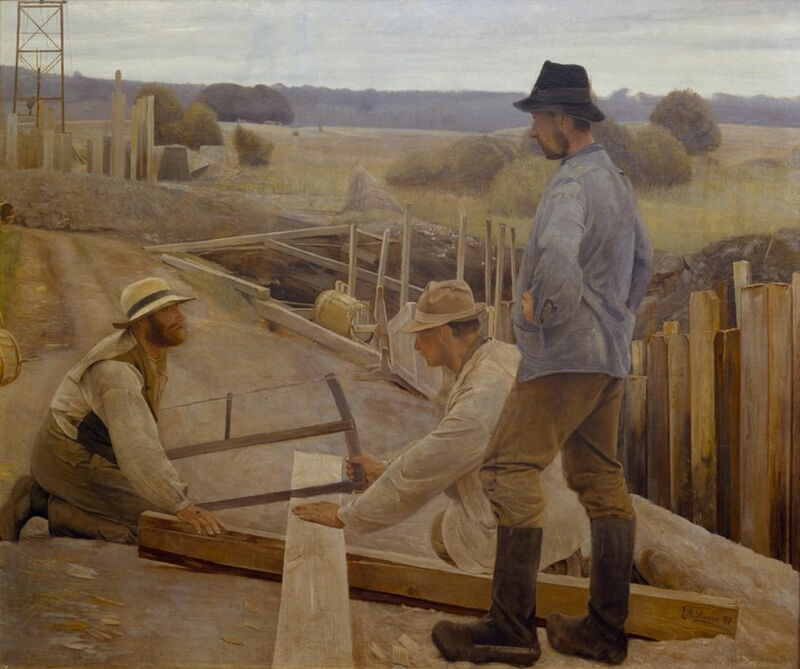 Laurits Andersen Ring (1854–1933), Workers at a Water Pipe at Søndersø (1891), oil on canvas, 155 x 185 cm, Fuglsang Art Museum, Lolland, Denmark. Wikimedia Commons. The following year, Ring painted these Workers at a Water Pipe at Søndersø (1891), in the north of the central island of Fyn (Funen). Two are skilled carpenters, who are sawing a plank of wood which is to be used in the construction work in progress behind them. The third worker, in his light blue jacket, wears rubber overboots on his wooden clogs, implying that he has been working down in the trench. Laurits Andersen Ring (1854–1933), Rooks on Plough Furrows (1891), oil on canvas, 56 x 75 cm, location not known. Wikimedia Commons. 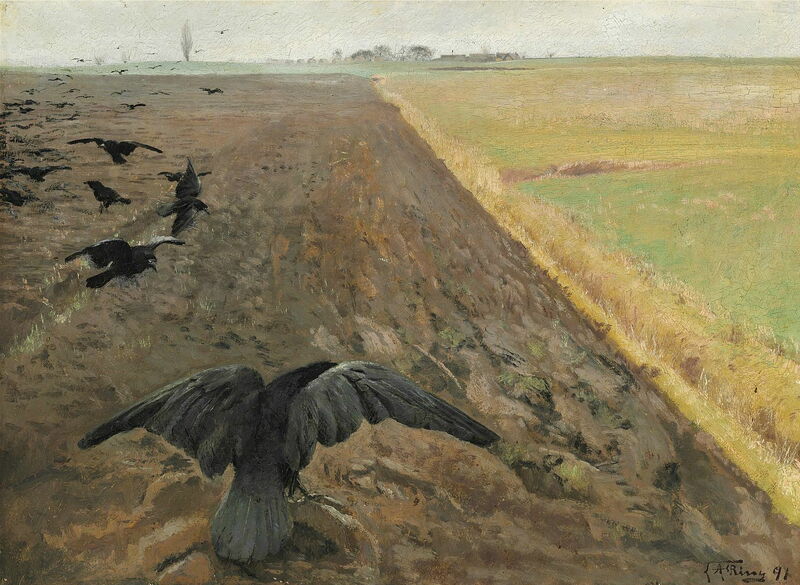 Probably painted among the flat grainfields closer to Odense, or in the south of Sjæland (Zealand), Rooks on Plough Furrows from 1891 captures the emptiness of the landscape. Laurits Andersen Ring (1854–1933), Conversation in the Countryside, Lille Næstved (1891), oil on canvas, 71 x 87 cm, Randers Kunstmuseum, Randers, Denmark. Wikimedia Commons. 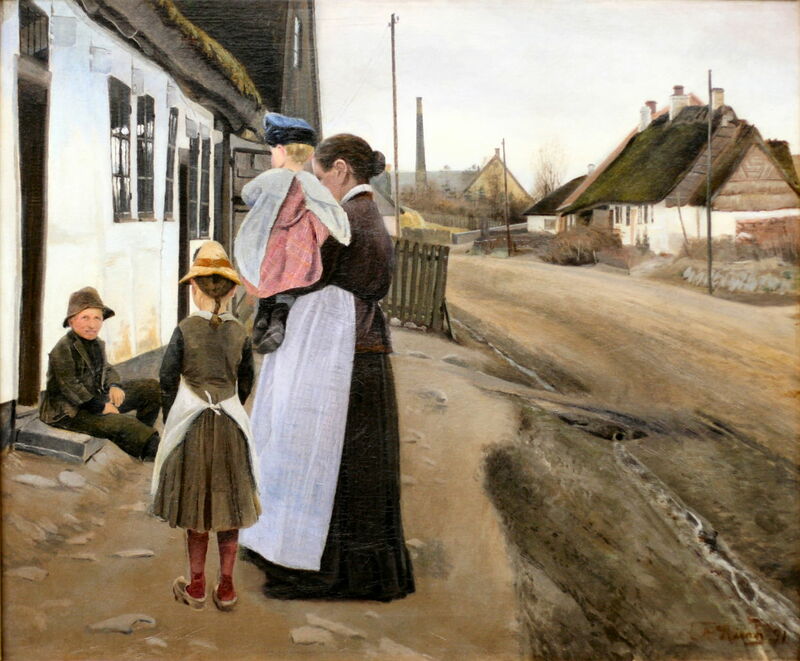 In 1891, Ring visited Herman Kähler’s ceramics factory again, and in the adjacent village painted this rural genre work, Conversation in the Countryside, Lille Næstved. It shows a mother with her two young children talking to an older boy, who sits on a doorstep staring at the viewer. Although the mother and family appear clean and quite well-dressed, the boy’s clothing is worn out and tattered. Running behind them is a small stream which functioned as the dirt road’s main drain. Most of the cottages are small, and thatched. The chimney of Kähler’s factory is seen in the background. 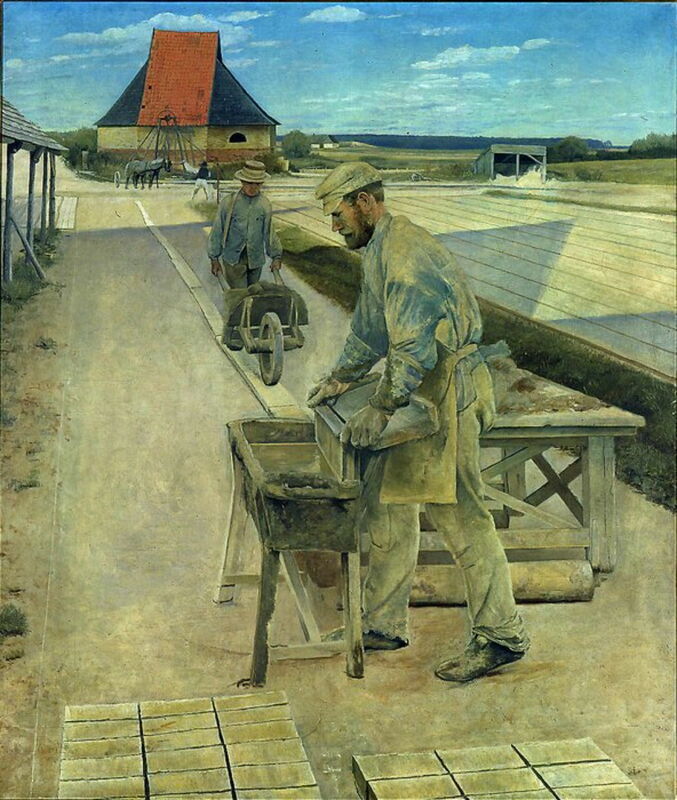 Laurits Andersen Ring (1854–1933), Brickmakers. Ladby Brickworks (1892), oil on canvas, 186 x 158 cm, Vejen Kunstmuseum, Vejen, Denmark. Wikimedia Commons. The last of this remarkable series of portraits of skilled workers shows Brickmakers. Ladby Brickworks, which Ring painted in 1892. Although the railways were starting to move goods like building materials around the country, most brickworks were still relatively small and worked by manual labour. This shows a regional brickmaking site on the island of Fyn (Funen), its workers forming the clay in moulds, and moving materials around in barrows wheeled along single-plank walkways to stop them from sinking into mud. In 1934, not far from here, a Viking ship was discovered buried in the ground. In 1892, Ring’s friendship with the Wilde family started to dissolve. It literally became more distant when Alexander Wilde moved with his work to the island of Møn, on the south-east coast of Sjælland (Zealand), leaving Ring in Copenhagen. 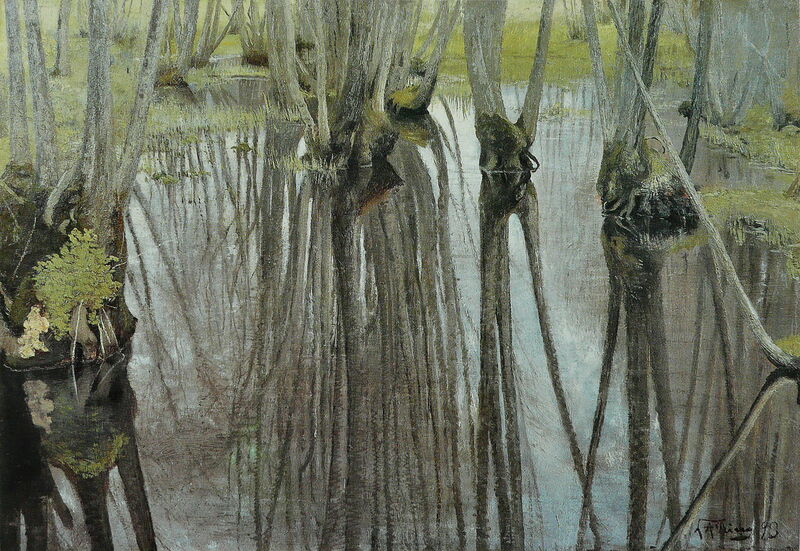 Alder Trunks from 1893 is one of Ring’s finest landscapes, and part of the Danish Royal Collection. In common with other innovative landscape artists of the time, including Gustav Klimt, Ring shows these old coppiced alders mainly in reflection. Although its details are quite painterly, the overall effect is still markedly realist. LA Ring’s reputation had been growing steadily, and in 1893 he was awarded funds to travel to Italy. 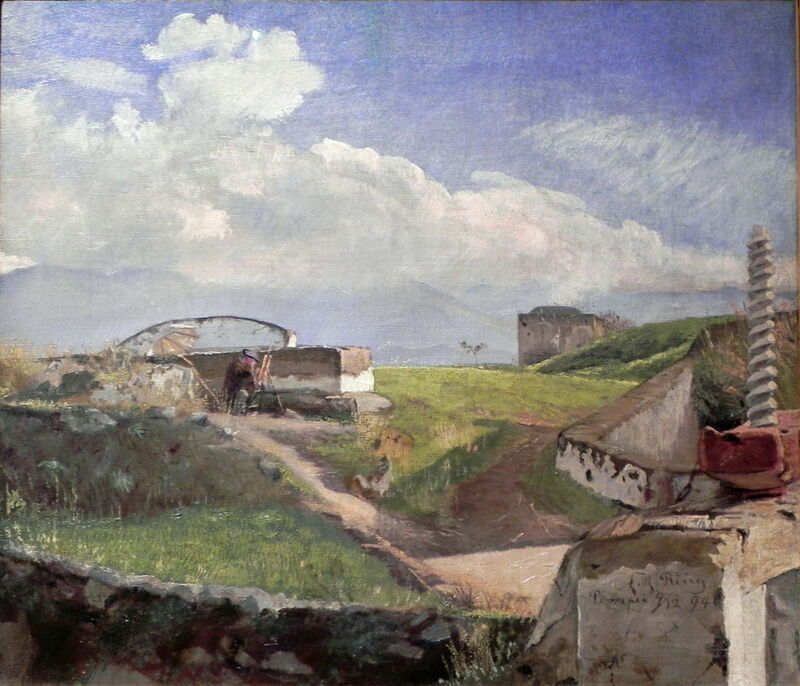 Laurits Andersen Ring (1854–1933), Lock at Pompeii. 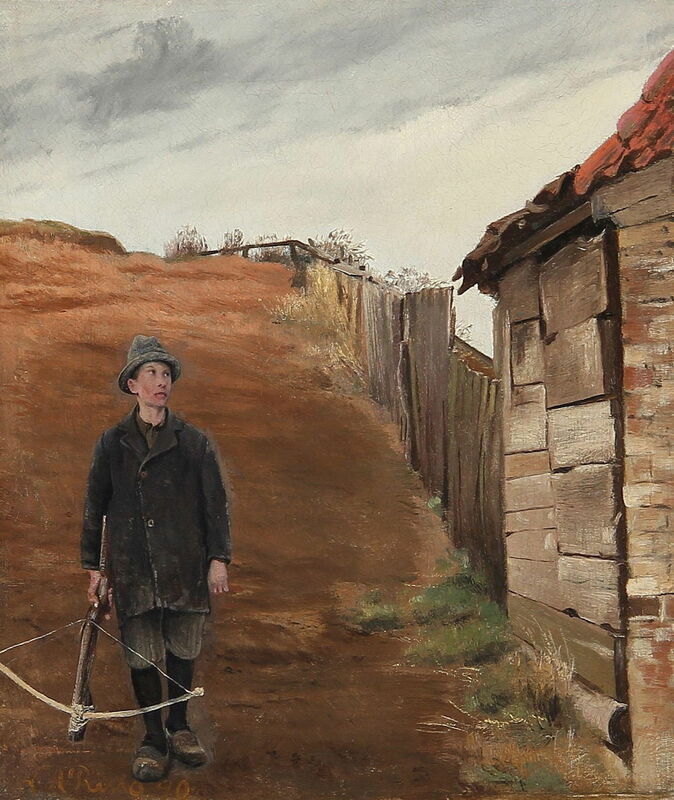 An Outdoor Painter with an Umbrella (1894), media and dimensions not known, Niedersächsisches Landesmuseum Hannover, Hanover, Germany. Wikimedia Commons. When in Italy, Ring painted en plein air in the far more accommodating weather. Among his landscapes from a visit to the ruins at Pompeii near Naples is this view of a Lock at Pompeii. An Outdoor Painter with an Umbrella (1894). In the foreground is the very post-classical structure of a lock in a drainage channel, and behind is another painter at work in front of his motif. Perhaps Ring was mindful of the paintings which his friend H A Brendekilde had made of him at work. 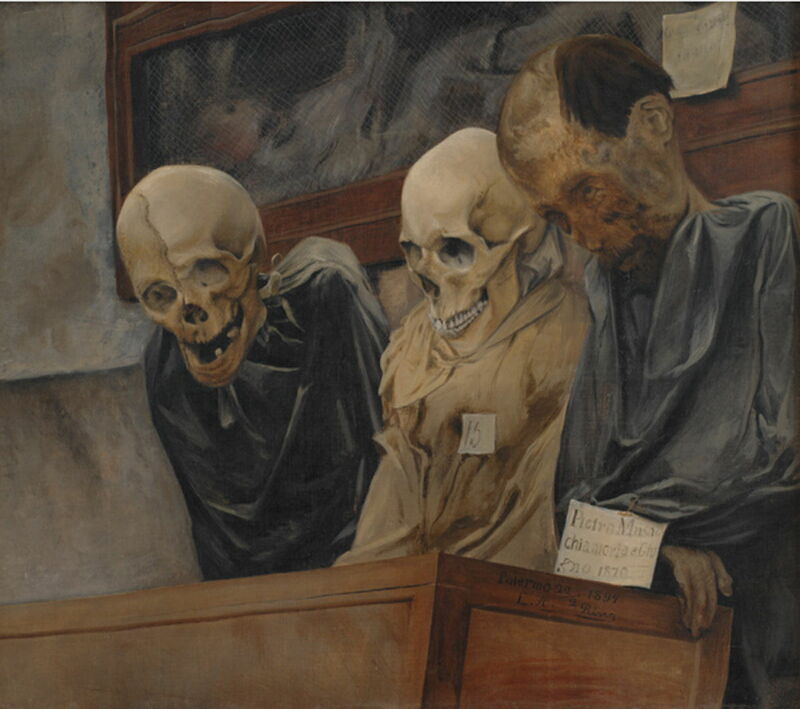 Laurits Andersen Ring (1854–1933), Three Skulls from Convento dei Cappucini at Palermo (1894), oil on canvas, 55 × 62 cm, Statens Museum for Kunst (Den Kongelige Malerisamling), Copenhagen, Denmark. Wikimedia Commons. Ring also visited the island of Sicily, where he painted one of his most unusual works, Three Skulls from Convento dei Cappuccini at Palermo (1894). The Cappuccin monastery in Palermo has long placed their dead monks in catacombs, where their corpses slowly mummify. Ring shows three of the over eight thousand bodies there, in another brush with the symbolism of death. These catacombs were, and remain, a tourist attraction. When he returned to Denmark, Ring was mortified to discover that his old friend Henrik Pontoppidan (who was to share the Nobel Prize for Literature in 1917) had published a novel in which Ring was the model for an unflattering character, a painter and failed revolutionary. What upset the artist most was Pontoppidan’s open revelation of his unrequited affair with Johanne Wilde. Ring’s friendship with Pontoppidan was over, but he started a new relationship with the daughter of Herman Kähler, a painter herself. Sigrid Kähler started to model for him, and that quickly blossomed into romance. Next week I will look at HA Brendekilde and LA Ring’s work from the later 1890s. Posted in General, Life, Painting and tagged Andersen, Brendekilde, Denmark, Kähler, Klimt, naturalism, painting, Pontoppidan, realism, Ring. Bookmark the permalink. interesting and beautiful work. It’s so beautiful to feel when someone is working on their art. Thank you. There are even better paintings to come next week in this series.